life so fragile all around me. it breaks all the time. "friends to hold until the glue dries". what a great line. I think this sums up the last 15 months for me, thank God for friends and for glue, without either we would simply be broken, thanks for the reminder. .. Would you mind if I reposted a bit of this on a blog for my Mom, she has terminal cancer and without friends .......well I don't know where we would be. this is wonderful.....and again so raw and honest. Such a beautiful spring image...and I think your friends are your glue!!! glue is good. you might still be able to see the cracks afterward, but it allows you to function. and sometimes the cracks just add to your beauty. your photo looks like a painting . until the glue dries and then some, my love. echoing all of the ladies who have arrived here today before me and joining in a big glueball of a hug! big fat tears welling up in my eyes, sooo grateful for friends and glue and your beautiful words and images. Indeed a warm embrace from a loving friend can hold us together when we need it. Lovely photo ~ deep thoughts. That is such a pretty photograph and so perfect for this well-written post. 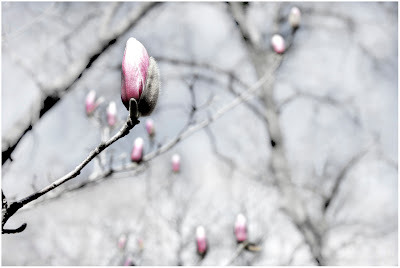 The magnolias look like pink flames amongst the bare branches. I am in love with the soft colors of this image. One of my favourite trees. So delicate. Life really truly does feel fragile doesn't it? It's an unsettling thought, and a comforting one at the same time. i think that has to be one of the most beautiful things i've ever seen written about friends. thank heavens for friends like that. i'd be broken and in pieces without them.